Vicky Halls, author of bestselling "Cat Confidential" and "Cat Counsellor" has now written the essential reference book for all cat owners. "The Complete Cat" is a comprehensive and practical guide that covers every aspect of cat ownership - from the original decision to buy a kitten to a layman's guide to many of the common illnesses and diseases. This book will save you hours of research and confusion by giving you a thorough overview on just about every topic; coupled with Vicky's expert knowledge this is an absolute must-have for cat owners! 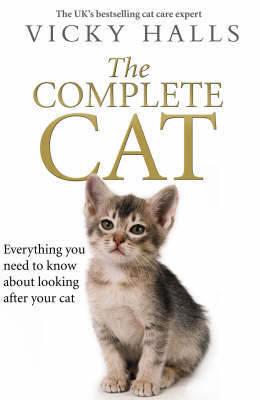 "The Complete Cat" has sections on: taking in stray cats; what to look for in a good cat breeder; effective flea control; diet and nutrition; giving your cat a tablet; poisonous household items; cats and babies; training your cat; special needs for the elderly cat; understanding normal cat behavior; and many more.